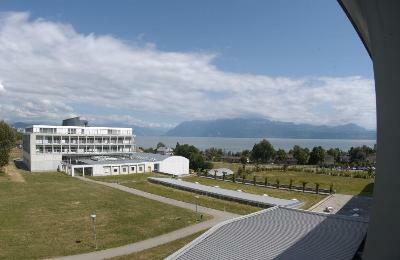 The CIG symposia are organized at the University of Lausanne, in the Génopode building, where the Center for Integrative Genomics is located. The oral presentations take place in an auditorium that seats a little over 200 people, a size that still allows lively discussions at the end of each presentation. Standing lunches and a poster session are organized in the building hall to allow numerous exchanges among all participants, both junior and senior scientists. The participation fees are kept to a minimum to favor the participation of all, in particular junior scientists. The number of participants increased steadily over the years, from 140 to 200 in 2017. The majority of the participants are junior scientists at the PhD or postdoc level. The Doctoral School recommends the PhD students to present a poster by submitting an abtract. Students will receive a certificate of attendance on request. This will allow them to claim between 0.5 and 1 ECTS credits from the Doctoral School of the FBM. This event usually corresponds to 1 to 1.5 training days. Participants are invited to submit abstracts to present either a poster or give a short talk, or both. In the begining of June 2018, some abstracts will be selected for a short talks, and all participants who submited an abstract will be informed whether their posters were selected. The poster list will be published directly on the online program.